Thanks for the reply. I just called them and they said I have to send a "location" ping from the apartment's location (the one I wish to rent or buy) so they can perform a coverage test. And there's a one time initial fee of around 220 USD. The problem is, I still haven't decided where I wish to buy or rent. What is the average connection speed in Lebanon at the moment? What can I expect, speed-wise, and reliability wise? Any other quirks? I'm talking about DSL-type connections, not "neighborhood cable" or others. SNR vary between buildings, but for most of us here speeds aren't stable. 7 Mbps, is this number realistic in your opinion and in your experience as a end user? Thank you. I live in an average neighborhood near a city(1.8km~ away from central),my internet speed hovers between 5mbps and 11mbps (the fluctuation is probably caused by poor cable isolation from the building).So yes, that number is realistic for me,ASSSUMING the user is living in/near a city. Ogero provide speed test for landlines, it is reasonably accurate, it will give you the Internet speed delivered to ogero box in your building. Just enter your landline number and it will give you the speed of your line. nothing to be proud off , we still one of the worst countries if not the worst , and one of the most expensive , wake me up when we have 50+ mb everywhere and with reasonable prices . @ManOwaRR, "50+ mb everywhere" ? Dude I have been looking for a new apartment (relatively new building 10 years or less with a phone line to use DSL). Sad reality is, this combination does NOT seem to exist in this country. You either need to rent / buy an apartment that is older than 20 years or so to find something with a phone line OR you can buy a new apartment in a new building and reminisce about the times you had DSL internet in your old apartment. I have been looking for more than 2 months with no luck. Might as well take a risk and buy a new apartment and try Terranet's Agogo WDSL service. But I fear that, if I do that, I might get stuck in that apartment for a very long time with no DSL (especially when FTC becomes widely available). Whenever FTTC is deployed, I emphasis on Whenever, it will be relatively easy to connect new building to the phone network. They will not be having any issues connecting the new building to the neighborhood cabinet compared to the area's or district's CO. I thought that it will be easy (and a phone box in the building would become unnecessary) only when FTTH (to the home) is available. As even when FTTC becomes a thing, you will still need your building to have a phone box (3elbit telephones) to be able to benefit from this. Yes I agree with you, but relatively it will be easy to have a box once you have FTTC in your area. They will have to pull a cable from the building the manhole in front of your building and through the conduits into the cabinet. Now they still have to have a space in the cabinet's primary and secondary cables that could be full. By using the fiber they eliminate the primary cable that runs all the way to the Central Office. i am dealing with a company called fast2serve in jbeil. they are one of the best! i am 16 k.m away from their base, using microwave technology as ogero's switch in our town is old thus slow. i always get pings ranging 15 to 50 and download speed of 5.5-6 Mbps and uploads of 4. but seriously thinking to change it to ogero's fiber optic when they deploy it here in q4 2019 as my home is only 150 meters away from the switch and have direct underground cable with it! what do you think ? should i change ?or stay with the stable one ? Once VDSL2 is deployed in your area, I would definitely recommend going with it. It would be more stable than broadband. Speeds would be 100 Mbit/s at up to 500 meters, and you might get even more if they don't throttle it. Again, this will be subject to pricing and caps that you have to refer to. Eventhough you have direct link to the cabinet, it doesn't mean that you might get the best of the speed. It all relies on the cable quality, cabling quality and loops inside your premises and the induced noise generated in your building, such as elevators. I have faced such an issue, if I connect the telephone jack loop inside the house, the speeds drops from 7Mbps to 2Mbps. Lo and behold, Open Speed, everyone. Man, I'm really just considering to switch to a non-DSL ISP at this point. It started out at around double that speed when I first installed (around 2 years ago). It progressively got worse, and I tried it all. Changed wiring in house, box, ADSL splitters, etc. Nothing worked. Ogero employees came over a couple of times but were no help either. They thought there's no problem. 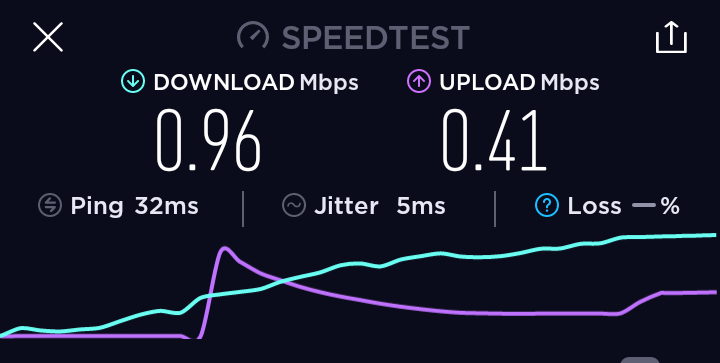 The speed kept getting worse, even though nothing's changing (I'm not doing anything that would make it become worse). Meanwhile, my neighbour's non DSL wifi looks like this on average. Not perfect, but I'm in the south and not in a main city, so it's as good as it gets. 3- if you have doubt, try to define the termination port of your cable at ogero's box in your building. Typically, it will be located in the electrical room. You have said that you used to have better speed, try to ask ogero to check the status and the health of the port linked to your account on the DSLAM side.